Bangalore: Alcock Ashdown (Gujarat) Ltd, the shipbuilding firm owned by the Gujarat government, has been left with four ships after a Norwegian buyer walked away from a Rs301 crore deal citing high costs even as tight credit lines and a deteriorating global economy cut freight rates, forcing fleet owners to cancel ship orders globally. Alcock Ashdown is now scouting for a new buyer for the four chemical tankers each with a capacity to carry 12,800 tonnes of cargo. The state-owned shipbuilder had started constructing the four ships for Seatankers Management Co. Ltd, owned by Norwegian shipping tycoon John Fredriksen. “Due to some reasons Alcock Ashdown and Seatankers recently decided to mutually close the contract. We are now looking for a suitable buyer who is interested to get the vessels built on profit-sharing basis with us or on fixed-cost basis," said an executive at Alcock Ashdown, who asked not to be identified citing company policies regarding speaking to the media. The executive did not elaborate on the reasons. A spokesperson for Alcock Ashdown declined to comment. Alcock Ashdown would also consider selling the partly-built ships, the executive added. 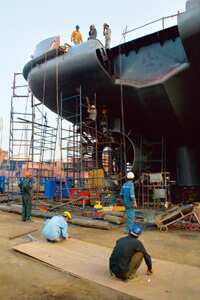 The construction on the first of the four ships was to be completed by December 2009 and the company had agreed to deliver one ship every three months after that. Seatankers Management had paid about Rs90 crore as advance for the construction of the four ships. “As per the deal, we have to pay that money back to Seatankers. So, we are in the process of finding another buyer for the ships," said the executive. The hunt for a new buyer, however, could pose a big challenge to Alcock Ashdown in a falling market. The slowdown in the global economy has resulted in reduced trade and lower demand for ships. “The prognosis for shipping is dire with massive over supply chasing deteriorating demand," Citigroup Investment Research said in a 1 December research note on ABG Shipyard Ltd.
“Consequently, ship prices have been falling, ship financing has become more cautious and shipowners are scaling back on new orders," the note added. Alcock Ashdown was originally owned by a British firm. When it ran into financial trouble, it was taken over by the Indian government in 1975. Subsequently, in 1994, the yard was acquired by the Gujarat government. The firm is currently building 30 vessels at a cost of Rs1,200 crore including the four tankers originally ordered by Seatankers. The Baltic Dry Index, which reflects demand for raw material shipments, has plunged by 93% since reaching a record high on 20 May this year. That’s left at least a fifth of the vessels most commonly hired to haul spot cargoes of coal and iron ore sitting empty.